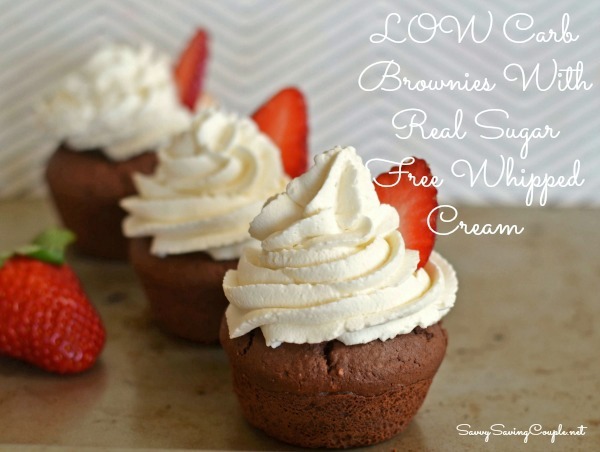 Our delicious low carb brownies topped with whipped cream! These would be awesome using our Double Chocolate Brownies too! Bake your brownie cupcakes according to package instructions. Allow them to fully cool. Using a stand mixer, add the heavy cream, vanilla extract, and sweetener. Turn mixer on high, and blend for 3 minutes or until soft peaks form. 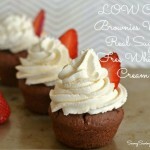 Fill a 16″ piping bag with whipped cream, and frost your brownie cupcakes. Garnish with a strawberry sliver.